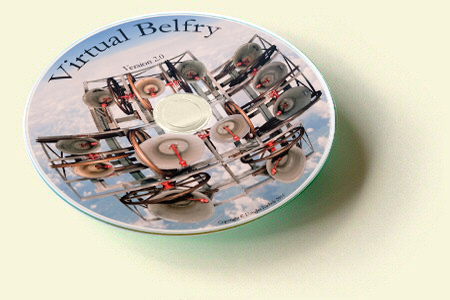 Your copy of Virtual Belfry must be registered with the author before it will be fully functional. The author sends you a key in return. The key will remove the restrictions of Evaluation Mode. How do I find my computer's registration code? The 10-digit registration code is at the bottom. Send that code to the author in order to receive your key. What information does the author require? If you are registering at the time of purchase and you are paying by PayPal, simply type the registration code into the field on the ordering page. If you are paying by direct deposit, include the registration code in the email you send to the author after making the deposit. The registration code from your computer. The author will send you your activation key by email as soon as possible. This may be within minutes or perhaps overnight. 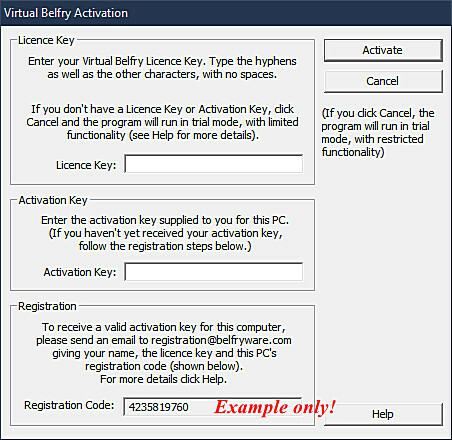 NB The licence conditions are intended to permit your copy of Virtual Belfry to be installed on computers owned and used by you. Installing the program on someone else's computer (or your tower's computer) will normally require the purchase of additional copies of the program. What do I do with my activation key once I've got it? How do I run the program in Evaluation Mode? Run Virtual Belfry. The above window will appear. Click the Cancel button. The program will then operate in evaluation mode (all the functions work, but if you start the bells ringing the program will only run for 10 whole pulls before stopping).